In spring 2014, Peers for Progress and the National Council of La Raza held a special meeting in San Francisco, California to discuss peer support programs for diabetes self-management around the world. Attendees expressed that one of the highlights of the meeting was having the opportunity to meet with peer health coaches from a local program at the University of San Francisco, California (UCSF). 6 peer health coaches sat on a panel discussion to share their experiences from working as health coaches. They were able to not only improve diabetes management amongst members of their community, but working as a coach also helped them with their own self-management. Hearing these powerful stories was inspiring for everyone with a passion for peer support. Building on this experience, UCSF published a new study in April that tested health coaching delivered by medical assistants in place of peer health coaches. In this piece from the American Academy of Family Physicians, corresponding author Rachel Willard-Grace explained the benefits of this model, “Prior studies have shown that additional patient support or case management by registered nurses, pharmacists or other licensed professionals can have positive impacts on patients’ health.” The researchers at the UCSF Center for Excellence in Primary Care wanted to evaluate medical assistants in particular, because they are located across primary care practices and are affordable than other licensed professionals. If effective, medical assistants could be trained as health coaches to help patients on a large scale. An article published in the March/April Annals of Family Medicine described the setting, training, and program results in great detail. The program was implemented at two primary care clinics in San Francisco. The first clinic was a non-profit federally qualified health care center that served a predominantly Latino population including many patients that were without insurance (79%). The second clinic had patients that were predominantly African American and publicly insured (73%). Neither of the clinics had used a medical assistant in the past, but for this study, three female health coaches that self-identified as Latina and spoke both English and Spanish joined the health care teams. After completing training, health coaches were assigned as many as 100 patients. They met with patients both before and after clinical visits, and followed up with them between appointments, scheduling face-to-face visits each month. There were three primary outcomes for patients with diabetes: achieving reductions in hemoglobin A1c, systolic blood pressure, and LDL cholesterol levels. Compared to standard care, patients that met with health coaches were significantly more likely to reach one of these goals (46.4 percent vs. 34.3 percent) and more likely to reach all 3 goals (34.0 percent vs. 24.7 percent). However, despite these positive findings, the authors noted several key observations to consider when expanding the role of medical assistants to include health coaching. For instance, the clinical improvements were primarily seen at the first clinic (serving a predominantly Latino population) but not the second (serving predominantly African Americans). The authors indicated this may have occurred because of differences in the quality of coaching at the second site, less frequent interaction between the coaches and patients, and the fact that the coach was not “culturally concordant” with the majority of patients there. 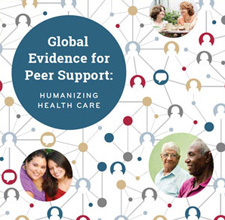 As noted in some of our previous discussion on peer support research, frequency of interactions and sharing lived experiences or cultural backgrounds can be critical to the success of peer support interventions. With increasing numbers of Patient Centered Medical Homes being implemented in an effort to control health costs, there is an unparalleled opportunity to take advantage of the unique skills of each member of a healthcare team. We applaud UCSF for evaluating the ability of medical assistants to serve as health coaches and providing critical self-management support to patients. This model shows significant promise for improving clinical outcomes which may ultimately reduce cost. We encourage our readers to visit the AAFP piece for a full interview with the corresponding author.